I have made a little overview of cool images I have found of male headgear and hair styles. Most of the images are of people from the upper classes but it isn’t exclusive to that. If you want to know more about the female fashion you can find that here. I gather pictures of head gear. I find them in illuminated manuscripts, sketches and in paintings. Some of the pictures are quite small and a bit blured, but I thought it was important to have pictures from different sources rather than just the famous high quality ones. They are organized by century and by style. 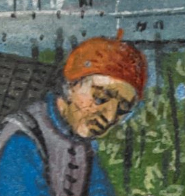 Among working men it would seem that the coif has been one of the most common pieces of headgear from the late 1100’s and fell out of popularlyt in the 1300’s. 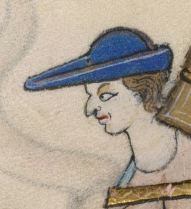 It is a simple linnen coif tied under the chin. Sometimes it is worn under other pieces of headgear. The capuchon in the form of hood and attached shoulder-length cape with a hole was cut in the fabric to frame the face. Sometimes they have a very long tail – it is actually the tail that is called a liripipe. Worn from the 1100’s onward. 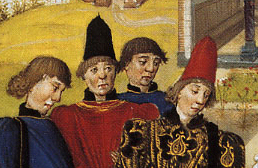 In the 1300’s people started wearing them on top of their heads and that is called a chaperon. Strew hats were made in a number of shapes from the typical round crown wide brimed sun hat to conical type assoiciated with East Asia. They were worn by travlers and peasants in the field. They keep rain and sun out of your face quite effectely. 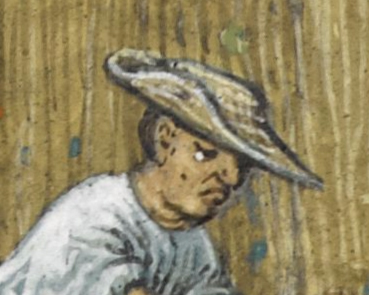 From the images I gather that bycockets (or chapeau à bec) became quite popular in the 1300’s and 1400’s. The bycocket, is what we would think of as a Robin Hood hat – it has a wide brim that is turned up in the back and pointed in the front like a bird’s beak. They were worn by men and woman and was in use between the 1200’s and the 1500’s. 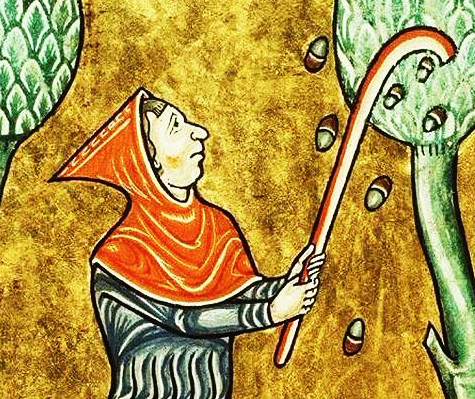 They started as a hat worn by nobility but the growing merchant class took to it. Some of them have quite tall crowns. Baglike hat that fits right around the head. It has a padded or upturned edge and the crown is soft and hangs to the side of the head. Kind of like a small santa hat. The crown can extend into a tail – like on a night cap. 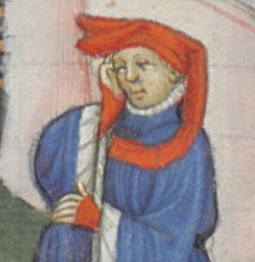 From the 1300’s the chaperon transformed from a utilitarian hood (liripipe) with a small cape to becoming a complicated and fashionable hat worn by the wealthy in town settings. This came when they began to be worn with the opening for the face placed instead on the top of the head. 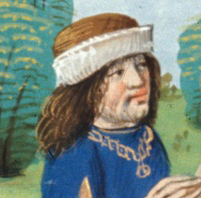 In the 1400’s changing masculine fashion dictated that the head should go right through the visor of the liripipe and the neckpiece be raised to form a crest on the head, often on a padded ring (bourrelet). The point of the hood was then worn round the neck or round the head. Worn in this manner it was called a chaperon. Inside church or in the present of high ranking nobility men would wear them over their shoulder. I kind of think of it as a baseball cap worn backwards for fashion purposes. 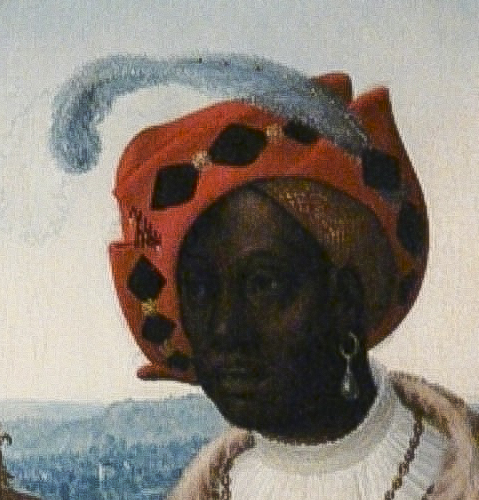 In the 1400’s quite tall what looks like felted hats come into fashion. They are mostly black. Often soft hats with the brim folded up. 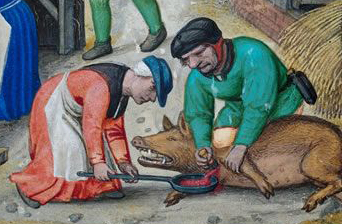 They seem popular in the 1400’s. Sometimes the all of the edge is folded up like in the picture and sometimes it is only in the back almost like a bycoket but with a tall crown. A beret is a soft, round, flat-crowned hat. 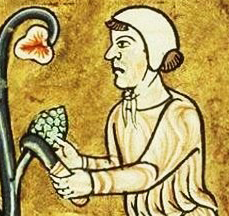 The biretta (Latin: biretum, birretum) is a square cap with three or four peaks or horns, sometimes surmounted by a tuft. Traditionally the three peaked biretta is worn by Roman Catholic clergy and some Anglican and Lutheran clergy.